You already love stacking rings in sterling silver, so why not in 14k gold?! These rings are SOLID 14k gold- not gold filled or plated! The letters on these rings measure 1/32" so they're super small! I can fit up to 40 characters including spaces and punctuation. Inside stamping is an additional cost, please convo me for a quote. - what three stones you would like and mm of stones. ***I also take custom orders- Convo me! BECAUSE OF THE COST OF MATERIALS AND VALUE OF THE PRODUCT INSURANCE IS INCLUDED IN THE SHIPPING PRICE FOR US CUSTOMERS. INTERNATIONAL CUSTOMERS PLEASE NOTE THAT INSURANCE IS ONLY AVAILABLE ON PRIORITY PACKAGING, UNLESS YOU CHOOSE TO SWITCH YOUR SHIPPING TO PRIORITY INTERNATIONAL I CANNOT BE HELD RESPONSIBLE FOR LOST OR DAMAGED ITEMS. 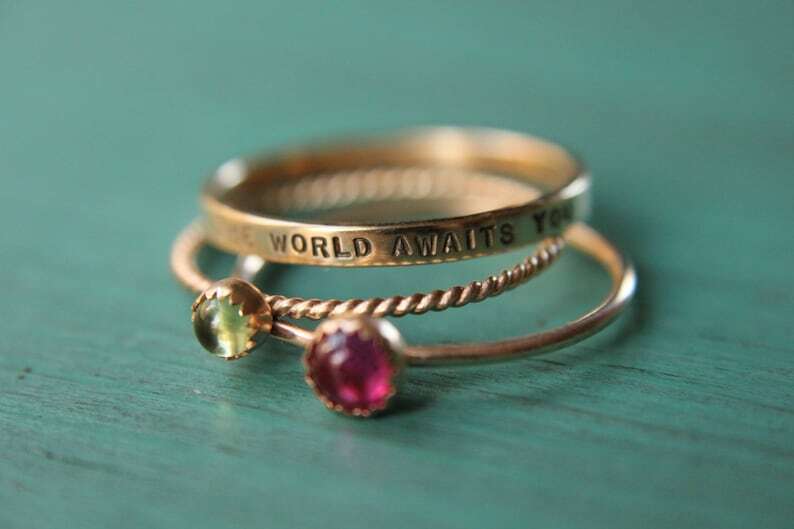 Three 14k rose gold gemstone stacking rings set. Custom band set of 3 rings gemstone stacking rings. Three 14k white gold gemstone stacking rings set. Custom band set of 3 rings gemstone stacking rings. Choose your gemstone. Two 14k white gold gemstone stacking rings set. Custom band set of 2 rings gemstone stacking rings. Choose your Gemstone. One 14k white gold gemstone stacking ring. Gemstone stacking band ring. White gold gemstone ring.